Heater Shop sell quality Rointe heating products at the lowest prices – in particular, the Rointe Kyros electric heaters have proved very popular with our customers. Rointe is an established electric heating company, based in Europe. Rointe are pioneers in the design, manufacturing and commercialisation of heating systems. The entire range of Rointe products can be programmed using the bi-directional ACMI120 remote control. 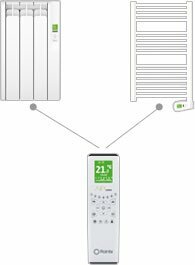 The ACMI120 remote allows you to create and configure your programmes, sending the configurations to all of your installed radiators, towel rails and water boilers. Rointe radiators, Rointe towel rails and Rointe hot water heaters can all be controlled using the same Rointe remote control. Rointe electric radiators come in a range of sizes to suit your needs. And don't forget when you buy from Heater Shop you'll get our best price guarantee, free next day delivery and free design service. Call one of our advisors on 01473 276686 for help with choosing a size that’s right for you. The Rointe Kyros Series are exceptional digital electric heaters: stylish, easy to use, energy efficient and low surface temperature.